You are here: Home / Sports / For the seventh time overall, and the first time since 2009, the Lincoln women’s outdoor track & field team is the national champion. For the seventh time overall, and the first time since 2009, the Lincoln women’s outdoor track & field team is the national champion. 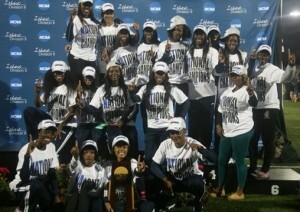 The Blue Tigers scored 64 team points on Saturday (May 24) to win their seventh NCAA Division II Outdoor Track & Field National Championship. Ten Lincoln athletes combined to turn in 12 All-American performances, with both Blue Tiger relay teams winning national titles. Lincoln, which has also won four indoor national championships since 2003, won their 11th overall championship this past weekend. The Blue Tigers had previously won the NCAA Division II Outdoor Track & Field National Championship in 2003, 2004, 2005, 2006, 2007 and 2009. Starting in the 4 x 100m relay, where the foursome of Judith Riley, Kimberly Bailey, Yanique Ellington and Janae Johnson won in 45.34. Ellington and Johnson would go on to earn three total All-American honors, given to any athlete who finishes in the top-eight on an event at the national championships. Johnson was the runner-up in the 200m, clocking in at 23.49, and took fifth in the 100m in 11.87. Ellington, meanwhile, placed third in the 100m (11.75) and fourth in the 200m (23.49). The day ended with the 4 x 400m relay. Entering that event, Lincoln had 54 team points and was in first place by just one point. Johnson C. Smith was in second with 53 points, and the two teams were going head-to-head in the relay with everything on the line. The Lincoln foursome of Willomena Williams, Jhevere Hall, Donna-Lee Hylton and Tamara Keane stepped up, winning the race in 3:37.29 to guarantee the Blue Tigers the national championship. Keane also earned All-American recognition in three events, including the 400m hurdles, in which she placed fourth with a time of 59.56. Keane finished seventh in the 400m dash, timing in at 54.22, while Hylton placed eighth in the latter event with a time of 54.91. Hall was also a multiple All-American honoree, as she placed sixth in the 800m in 2:09.35. Monique Thompson had the best performance by a Blue Tiger in that event, claiming fourth after posting a time of 2:08.76. Lincoln’s final All-American award winner was Ladonna Richards, who took fourth in the 100m hurdles with a time of 13.32. The Blue Tigers scored 64 points, beating second-place Johnson C. Smith (59 points) by five points. Grand Valley State, which hosted the national championship meet, came in third after scoring 53 points. Adams State (39 points) took fourth, edging fifth-place Ashland (38 points) by one point. Central Missouri, meanwhile, had the second-best finish of any MIAA program behind Lincoln, taking sixth with 34 points. Missouri S&T and Northwest Missouri also competed in the women’s championships. Recap courtesy of Lincoln Athletics. The Lincoln University men finished tied for ninth. Missouri Southern, Central Missouri, Southwest Baptist, and Missouri S& T also competed in the men’s championships.